I am a leader in a Sea Scout ship. Someone is looking to donate a Hobie 16 to our ship. The boat is from the 80's I think but the starboard top deck has soft spots along the middle of the top deck. The hulls are nice and solid, just the top deck. How hard is it to fix the top deck? It is a skill that the scouts could learn from I think. I was imagining that I could cut out holes for access ports and we could get the inside and then repair it from the inside but I haven't don't this before. Soft hulls are caused by the foam and fiberglass layers becoming seperated or delaminated. This can be caused by heat, repeated compression (walking on) or other factors related to materials and age. This is normally correctable. 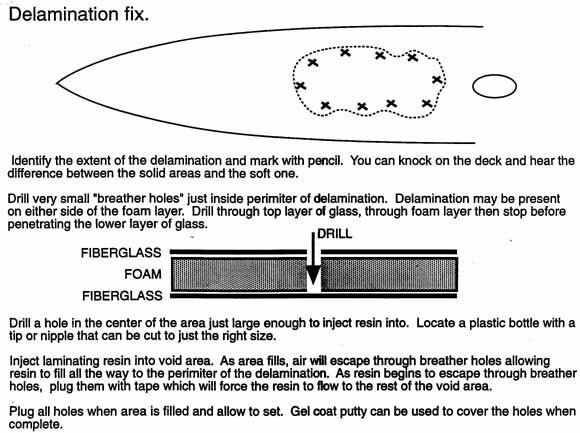 A soft area is a structural breakdown and should be corrected before sailing the boat. Soft areas in decks near or ahead of the forward cross bar can cause complete failure of the bow and must be repaired before sailing the boat.